The Stamford Grand Adelaide is bringing in summer with fresh produce and simple cooking. 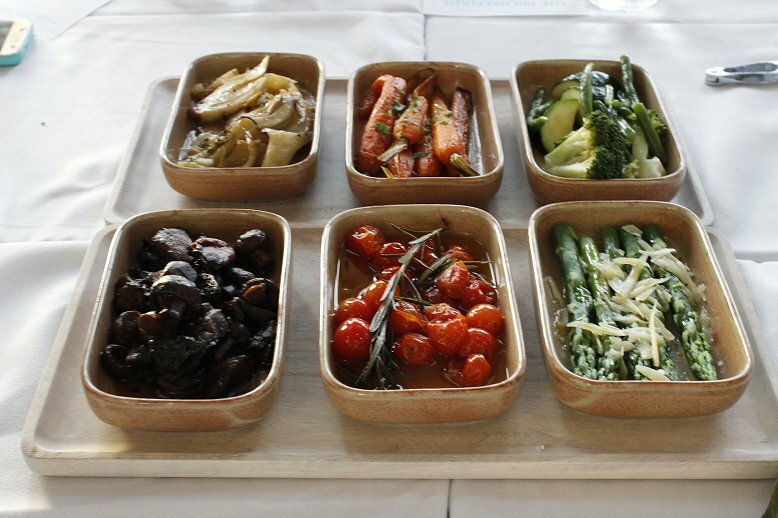 Adelaide Food Central was invited to the hotel’s Promenade Restaurant, to put it to the test! 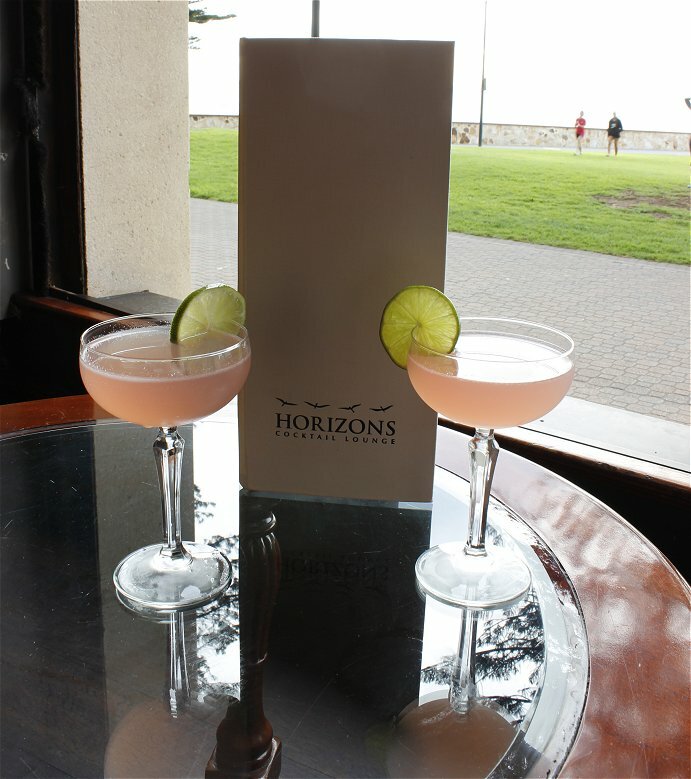 We were first invited to the Horizons Cocktail Lounge to sip on the cocktail du jour, grapefruit-pink cosmopolitans. The soft colour was deceiving, as the drink was strong. The alcohol was noticeable, and complimented by the faintest trace of fruit. A cocktail that can stand on its own. The Horizons Cocktail Lounge itself suggests refined elegance. Deep leather sofas look out toward the beach, and large open windows allow the summer air in. The view is spectacular. We then moved to the Promenade Restaurant, where we sampled seafood entrees, salads and sides, mains and desserts from the summer menu. The theme was fresh produce with simple, light cooking. This worked well because the produce, sourced locally, had enough flavour to stand by itself. The menu is intended to be shareable. Food is served on platters and side dishes, and portions are plenty. It’s a social menu for sure. We were treated to a large display of seafood, as beautiful for the eyes as for the taste buds. It featured oysters, mussels, pipes, prawns and crabs. There was a side of sauces, all satisfying but not really needed. The seafood was fresh enough to be eaten on its own. The oysters were a stand out. They were very soft, almost creamy, with a delightfully light but strong flavour. The mussels were a similar story. However, I found the pipis slightly too chewy. The flavour was there, but they diverged from the rest of the platter. Both the prawns and crab were crisp in texture, neither too soft nor too chewy. They were juicy with flavour and an absolute delight to eat. 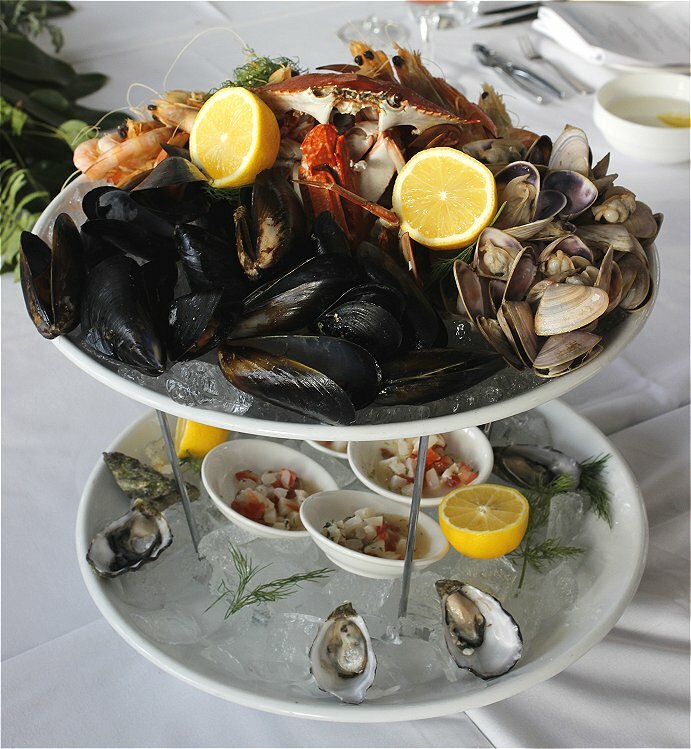 Seafood lovers: Promenade Restaurant is where you want to be. The salads were a lovely touch. They added a lightness to the meal. There was a buffalo mozzarella salad, which was interesting and different. Buffalo mozzarella has a different texture, and a lighter flavour than regular mozzarella. The Caesar Salad was a fantastic palate cleanser. The sauce was creamy, and gentle. While the bacon was very thin, it was not overcooked. It was a light salad and an excellent addition to the meal. However, the sides stole the show! All vegetarian, different flavours and textures were mixed to create an interesting combination. They were all very heavy, but felt like comfort food done to perfection. A standout was the mushrooms glazed in balsamic vinegar. They oozed flavour! The balsamic brought out a sweet side to the mushrooms, and I kept going back for more! The tomatoes followed suit, as did the baby carrots infused with honey. The fennel was another delightful challenge. Was it sweet, was it sour? Most certainly a bit of both! The fennel side was quirky and perhaps the most challenging dish of the night. Promenade create the strong, unusual flavour with lemon and sage, and I highly recommend giving it a go! The three meat-based mains dishes were all vastly different, yet all birds of a feather. 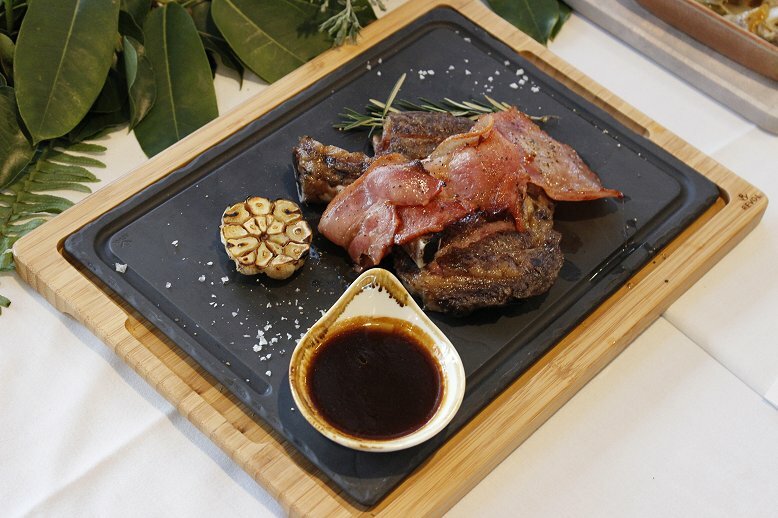 Diners can choose from marinated chicken, lamb porterhouse chops or oven-prepared steak rib-eye. All the mains were enjoyable, and harked back to simple cooking, allowing the produce to be the spectacle. The chicken was the most interesting main. It was soft with just enough chew and texture. In short, it makes you appreciate it. Paired with a gentle pesto sauce, it had great balance in flavour. 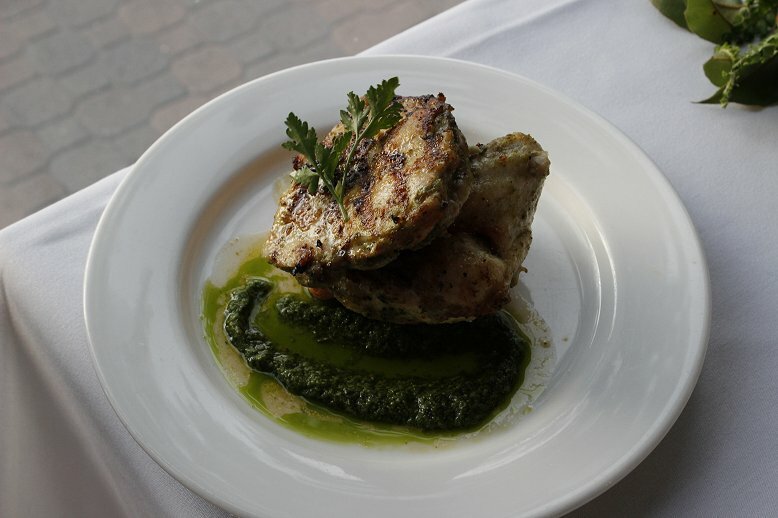 The pesto adds kick without detracting from the flavour of the chicken. It was a simple dish, but done extremely well. The oven-prepared beef rib-eye was also a classic cooked well. It was thick, however cooked medium-rare so not too tough. It oozed juicy flavour. There was a thin sauce to go with it, however this steak was perfect on its own. The sauce added a bit of extra flavour, but it wasn’t needed. The lamb was peppery, and juicy with flavour. It had a soft texture and easy to bite into. Once again, a simple dish cooked to perfection. As we dined through the evening, the sun set over the ocean, of which the Promenade Restaurant has a beautiful view. The easy, calm scene complemented to food perfectly. Where the Promenade Restaurant shines is with their desserts. It’s full of classic and an absolute joy for the taste buds! I sampled a pavlova to rival the CWA’s best. It’s dished up on a substantial portion, so could easily be shared. A crustless pavlova sits in a sauce of rich chocolate and chewy cherry pieces. This balances well with the soft marshmallow. It’s rich, but delicious! I couldn’t resist trying the brownie, and was not disappointed! Thick, rich and melt in your mouth like any good brownie. However, it wasn’t too sweet, moreso chocolatey. Simply a classic done well. The fig, pistachio and raspberry tart was delightfully different. The combination of ingredient created a sweet, but nutty flavour. The topping was sweet, however it balanced well with the tart itself. Lastly, I tried a lemon pie with lavender meringue and blueberries. This lemon tart went beyond any regular one. It was bursting with lemon flavour without the bitterness. The lavender meringue offset the full flavour and they complemented each other well. Overall, this was a lovely meal, suitable for anyone. It focused on fresh, local produce and simple cooking. It was lovely and comforting with only the slightest challenge. The seafood absolutely stood out above the rest! However, all the dishes were delightful and the Promenade’s summer menu is fresh, simple and done to perfection.